If you’re in Harlem this Saturday, head to the Black Urban Growers Conference. Ced Southerland and I are presenting on the impact of zoning ordinances on local food systems. What if we told you that the one policy that controls local food production, distribution, and consumption has nothing to do with food; but is driven by land development and the built environment? “What’s Land Got to Do With It?” Is an exploration of local land land-use and zoning policies and how they impact growing and distributing fresh fruits and vegetables. The presentation is a hybrid workshop and roundtable that will incorporate a formal presentation, interactive demonstration, and a question and answer opportunity. 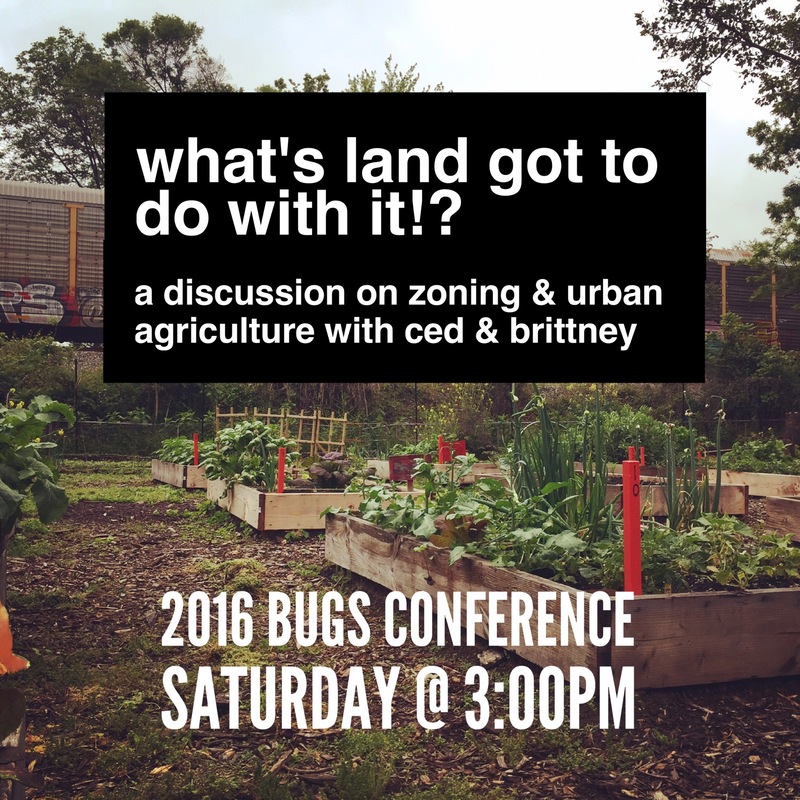 Presenters will provide an explanation of Zoning and Land Use history and purpose; showcase an investigation of current policies that restrict or limit local food production systems; and facilitate a community brainstorm on potential policy changes and advocacy methods that can remedy land-use conflicts. Concluding the presentation participants should (1) have a fundamental knowledge zoning and land-use planning; (2) understand the impact of urban planning, land-use, and zoning on local food production systems; (3) have a general awareness of the public participation processes in local-use and development review process and (4) feel encouraged to get engaged in local land-use development projects to advocate for healthier foods in their community. Much love to all who attended the workshop on What’s Land Got to Do with it!? at the 2016 Black Urban Farmers and Gardeners Conference in Harlem. We had a great conversation and were left with some to do assignments to help support zoning advocates! You can download the presentation for What’s Land Got to Do with It!? here. One of the items we discussed producing was a checklist of items that all people should know or become familiar with to advocate for better land use planning or zoning regulations in their community. We worked one up and you can download that here. For those of you who want to learn even more about urban planning and zoning, we prepared a list of reading and watching materials that will keep the conversation going. Please feel free to share any other ideas with us! Smart Growth Manual by Andrés Duany, Mike Lydon, Jeff Speck. Dumping in Dixie: Race, Class, and Environmental Justice by Robert D. Bullard. Building Healthy Places Toolkit, Urban Land Institute. Sprawling from Grace, David M. Edwards. Absolutely awesome presentation. Overwhelmingly informative. Knowledge is power. It’s the ability to move with deliberateness and with the confidence that you’re moving in the direction you want to go. Thank you Brittney and Ced! Ayelock! Thanks so much for the feedback and encouraging words! I’m glad you found the presentation informative! There is so much more we could discuss about land use issues, policy, and law. I’ll try to share more information soon.